ROYALTY RATES – WHAT IS THE STANDARD? One of the questions we are asked a lot is “What royalty rate percentage should I ask for in a License Agreement?” And the answer is . . . it all depends! You should always try to negotiate the largest percentage you can, based on the knowledge you have of the distribution of the product to retail (where are the products going? ), the type of product being licensed (some products inherently yield smaller royalties) and your “status” in the field of art licensing (have you earned the right to ask for higher percentages based on years of good sales and a name brand?). You should be aware, though, that if you are just starting your career in licensing, do not expect to get industry maximums. The Licensing Industry Merchandisers’ Association (LIMA) recently released the average royalty rates for the vast number of industries currently doing licensing, and we thought we would share them with you. 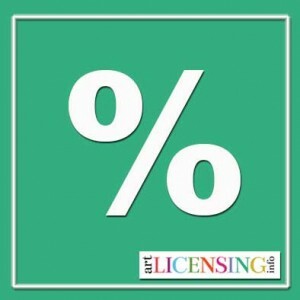 Let’s start with the most significant and relevant average to most people reading this blog – that of Art Licensing. LIMA reports that the average royalty for art licensing agreements is between 3 – 6 %. Based on these averages, you should expect a good deal to be in the 5% range; higher if you have credibility in the marketplace, and lower if the distribution is to mass retailers or discount channels. There are so many factors to consider when entering into a Licensing Agreement, with royalties being one of the most important. While these rates may not always apply to your situation, they do give you a general framework from which to make your recommendations when doing a deal. Would this be a percentage of their wholesale or retail? For fine art canvas reproductions, I’ve been offered $3-$6 each. I see the framed retail of the work is sold for right around $1000. Generally this would apply to wholesale prices (which we find to be the norm in the industry). As for the percentage/flat fees you have noted, this seems pretty far out of a normal range (.3 – .6% of the sale). Clearly the manufacturer is making a good margin on a $1000 sale. It might be worth further discussions with them to increase the flat fee, or seek an percentage of the sales. I must say, that is ridiculous. Is this a large, commercial venue, or a fine art gallery that also sells reproductions? I’ve been working in the fine art field for some time, and even selling wholesale is 40-50% off. Galleries work from the same model. If they’re only offering you pennies on a thousand dollar sale, you’re getting seriously ripped off. The more a place sells your work for-the more you should be seeing. I would find representation elsewhere. Thanks so much for your comment! I believe there is confusion about the various markets we are discussing. In our post, we are dealing with the licensing of artwork to manufacturers or licensees, in which they have use of your artwork for placement on products that they produce, sell, and distribute. If I understand it correctly, you are addressing fees associated with selling original pieces of artwork or high quality prints directly with/through galleries; which is an entirely different world and pricing model than licensing. Both involve the artwork created by an artist, but the similarities stop at that point. When you license your art, you are giving rights to a manufacture to reproduce that art and the marks associated with that art on products they manufacture. The risk, and cost, is solely on the shoulders of the manufacturer – risks/costs that involve selling into retail (and the associated expense of a sales to team to do this), margins, markdowns, returns, and discounts associated with the dealing with retailers. As such, the percentage of the overall sale of an individual product as it relates to the artist is very different than offering originals or high quality prints to a gallery. In the end, licensing one’s artwork has great potential for a large revenue stream as the product is out at multiple retail locations, across the US and possibly the World; each one making a percentage for the artist with each sale. Clearly you see a different pricing structure in the realm of gallery work. And depending on one’s strategic decision for their business, and the type of art they produce, each scenario has the possibility to work well for that artist. I hope that clarifies the issue and difference of percentages between art licensing and working with galleries. If you sell your artwork directly to company and When they buy and paid artwork money, they can have all licensing and just paid one time price (e.g=$300),and they can use whatever they want. Is it possible make a deal with companies like that? Yes – this can be done by either 1) selling your art on a flat fee basis, indicating that once purchased, the purchaser owns all rights to that artwork (and subsequently you forfeit your rights in exchange for the money), or 2) being hired by a company for “work for hire” – a company secures your time to design exclusively for them, and whatever you produce is owned by them. We see this direction a lot in the surface textile market, where companies purchase flat pattern art for their purposes. The caveat to this approach, though, is you are giving up all rights, copyrights and trademarks associated with the work you produce, and cannot use that art again. If that is acceptable to you, there is a market for that direction. Interesting article, and your information seems spot on. I have noticed in the past couple of years, a number of artists have reported that their royalty percentages have been dropping a point or two. I’m not sure if this is anecdotal, or is an across-the-board trend. There is also complaint in the print-on-demand sector that royalties have tightened. What is your experience? We haven’t experienced a drop in deals we are doing, aside from the decreased amounts being asked for in mass channels. Everything seems to be in the same ballpark; although it may be that we start our our negotiations asking for specific amounts and not waiting for the Licensee to suggest. As for the print-on-demand sector, rates are all over the board as more and more companies are entering into the market. As these companies are not “true” licensees, meaning they generally expect the artist to do the marketing for their specific products versus pitching directly to retailers or the wholesale market, rates have been crazy, and to the point of being ridiculous. I am not sure there is a good guideline to share in this realm. Thank you for posting this information! I have a question semi-related. Recently I was asked to sign a non-compete for an image broker who wanted to help me license my work. (I turned it down.) But is it standard to ask for this sort of exclusive? In what scenario would a non-compete be required? Thank you, in advance, for your guidance! Good question! As with everything in the world of licensing, the correct answer depends upon a variety of aspects of the deal. It is not uncommon for a Licensee/Manufacturer to seek exclusivity on a design (which would correlate back to the term “non-compete”), but these types of requests can be modified to be mutually beneficial to both parties. What we tend to use as language today is to offer an image as “exclusive by design by product category.” In this manner, you are giving a Licensee the right to have that specific image on an exclusive basis for only those product categories defined in the License Agreement. As your goal in art licensing is to create a piece of artwork and leverage it across as many product categories as possible, giving complete exclusivity to a Licensee doesn’t make sense (unless of course they were guaranteeing you multiple product categories and the opportunity for a Guarantee). Conversely, a Licensee does not want you to license the same artwork to another manufacturer. So, in order to satisfy everyone’s needs, offering an image exclusive by design by product category gives them what they want, and still offers you the opportunity to license that artwork for other product categories. (Of course, I would always include language in a License Agreement that ensures that if the Licensee does not produce the product over a defined period of time, rights to that product category revert back to you!). I would try to avoid having the language “non-compete” in the Agreement (as this can mean so many things), and steer them to more definitive language – exclusive by design by product category. Also, be careful of any Agreement that asks you for exclusive rights to product categories outside the “normal” realm of a manufacturer’s expertise. Keep your Agreements well defined and exacting. To my original statement, though, this is a general rule of thumb, and may need to modified based on each individual situation.